Am I British athletics' nearly man? You might have seen me struggling to finish dead last at the World Championship trials a few weeks ago. It wasn't pretty. 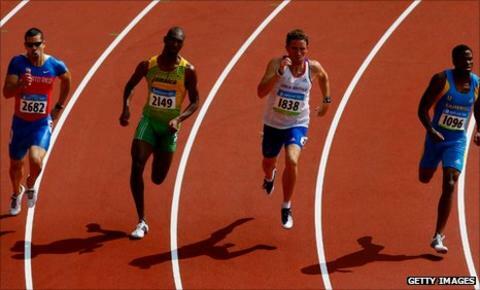 Once upon a time, I ran under 44.94 seconds in the 400m at the Olympic Games. That's pretty good, I promise. I am now more than £10,000 in debt, with an immune system ravaged by Epstein-Barr virus (or glandular fever), pride swallowed, confidence shattered and, most importantly, my dreams and goals of the last decade close to being laid out before me in tatters. It wasn't meant to be like this. I'm in danger of becoming the Nearly Man. Writing this could be a pointless exercise in self-absorption, but I want to highlight the lesser-told story of elite sport: the one that doesn't necessarily end in glory. Inspirational quotes from sportsmen are endemic - thanks to Twitter, more so now than ever. See if you can pass an hour online without some warble about self-motivation attributed to Armstrong, Woods or Ali. My career is running out of 140-character slogans to fire its engine. The world tells you that if you believe in something, set goals, dedicate yourself to it tirelessly and pick yourself up if you don't succeed, eventually you will be rewarded. This reward has not turned up. A few weeks after the Beijing Olympics, my physiotherapist confirmed I had a hernia. I thought it no more than a small setback. At the time, I was very optimistic about my future athletics career, my mind indulgently cast into a world where I would run under 45 seconds on a regular basis, perhaps working my way towards the British record of 44.36 over the next four years. Then untold fame and wealth or, at least, an appearance on Question of Sport. That was October 2008, and I was 23. Since then I have competed in a grand total of zero major championships. I didn't run at all in 2009 after a groin injury occurred just before the season. I was advised to call the season off to prevent a stress fracture. Ignoring the doctors seemed foolish, as I wallowed in the wonderful optimism a sub-45 clocking had afforded me. "That's fine," I told myself. "In 2010 I will announce my presence on the athletics circuit in a blaze of glory." As April 2010 came to a close, I came down with a bit of a cold. Two days passed and I felt normal again. But, when I returned to the track, something was wrong. It wasn't an injury as such, but my hamstrings were abnormally and excruciatingly tight on both sides. I was struggling to run, and none of the team physios could relieve the sensation. I was finding it hard to sleep, waking up almost every 90 minutes, all night long. Two weeks later I was very, very tired, and running times in training that were just embarrassing. A month prior I had been on top of the world, and now I could barely beat the club-level athletes I trained with. I felt as though my athletic ability had been erased overnight. It turns out, it had. I was diagnosed with the Epstein-Barr virus, and a weight lifted from my shoulders as we finally put a name to what was going on. That was quickly replaced by a descent into the reality facing me. My 2010 season was being stolen from me. Not again, I thought to myself. I was already living on less than minimum wage and using debt to pay off other debt. I was not in a position to abandon the season without at least trying. What if I could pull it off? Everyone warned me about pressing on regardless, but I literally had no choice. I turned up at the European trials floating around in a cloud of insomnia, adrenal exhaustion, muscle twitches and hot flushes. In August that year I came home from the worst training session of my life to find a newspaper interview with former 400m runner Roger Black about his struggle to beat Epstein-Barr. I spoke to Roger. I spoke to my coach, my family and anyone else even vaguely involved, and I made the decision to stop for the year to give myself the best chance of recovery. But the route out of Epstein-Barr is complicated and ambiguous. There is no real treatment. The virus can attack the brain - in my case the Hypothalamus, the part that controls your "fight or flight" response - which gives it a psychological potency. That makes onlookers think "it's all in your head". I had to swallow a lot of pride to overcome my northern mockery of things to do with the mind. Nobody gets glandular fever at war, do they? Did any of the shipbuilders of the north-east withdraw from the Jarrow March with chronic fatigue? However, I could not deny that my ability to run fast, which was kind of important to me, had vanished. The 2011 season approached and I wasn't setting the world on fire in training, but I was running reasonably well. On 9 July I posted my season's best of 45.94 in Madrid, the fastest I had run since 2008. It left me completely exhausted but optimistic, backed up by some of the best training sessions I'd ever had. I was incredibly excited to get to the world trials. Even when I woke up with a cold, I only thought myself lucky that this was two weeks before the trials rather the week running up to it. By Friday I felt better but, when I asked my body to sleep on Saturday night, it refused. Was it happening again? I turned up at the track on Monday morning and the sensation was terrible - and exactly the same as the year before. A seemingly normal cold virus resulting in a sudden drop in form. I reached the trials and came through a tightly contested heat, but it emptied all my reserves. The final was awful. I finished last, giving everything I had to run the kind of time I used to laugh at. As a result, here we are. The GB team are competing in Korea at the World Championships, while I mull the results of a scan which confirms I have an enlarged spleen again - one of the indicators of Epstein-Barr. It has happened again. And now I face the reality. In all likelihood I will be cut from lottery funding at the end of this year, and rightly so. UK Athletics have been wonderful in keeping me on through all the troubles thus far, I am incredibly thankful for that. I have almost no other income; the amount I was receiving in lottery funding was barely enough to live on anyway. Unless I find some sort of large private sponsorship, I will be forced into retirement less than a year before the biggest event British sport has ever seen. Can I really just be some guy working in a shop somewhere while the London Olympics inspire and improve our country? While my one-time contemporaries achieve greatness? I really don't want a reasonably fast run, in a preliminary round of a major championship, to be the only highlight in a decade of hardship and discipline which left me with five-figure debt. This is the lesser-told road, the one that ends in a muddy field, not an awe-inspiring land of BBC montages soundtracked by Sigur Ros. For every success, there are many, many more for whom things did not go right. That's the beauty of sport. You don't embark on a quest for Olympic greatness because it's a guaranteed easy ride. Fingers crossed, I can change the cards I have been dealt. Read more on World Athletics 2011: Will Daegu be Britain’s best ever?